Poor English speaking skills might be the key factor that is keeping a large number of India’s engineers from landing some of the best paid jobs in the country. A study developed by Aspiring Minds has indicated that a staggering 97 per cent of Indian engineers do not have a level of English that is good enough to land high-end jobs in corporate sales and business consulting. Even more alarmingly, 67 per cent of Indian engineering graduates do not have the spoken English skills needed for any job in knowledge economy. The change could be due to a shift in the focus of education on chemistry, maths and physics rather on soft skills indicates UB Desai, director of IIT Hyderabad. “Over the years, the focus in the education system has shifted to chemistry, maths, physics. Focus on soft skills has reduced. Students may lose out on good job prospects as many companies come to campuses for global positions as well,” he said. As presumed, students do much better in the metropolitan areas in spoken English than those in the non-metropolitan areas. The problem is not always that the students do not have the skills but they need to be coached in how to use them effectively. Kushal Sen, dean — faculty at IIT Delhi, confirms this. “A majority of our students may not have the problem of speaking in English but about 30 per cent need to be groomed when it comes to soft skills,” he said. Those colleges situated in Tier-1 cities do much better in spoken English skills than their contemporaries. “As expected the spoken English ability of candidates becomes worse, on average, in campuses in lower-tier cities,” said Varun Aggarwal, co-founder and chief technology officer, Aspiring Minds. 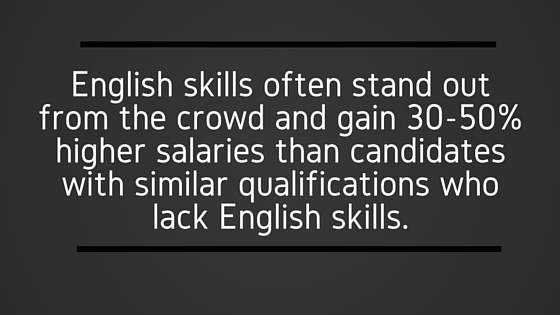 The lack or poor quality of spoken English may be causing Indian engineers to miss out on great opportunities. Recruiters and HR managers worldwide, report that candidates with above average English skills often have an advantage and stand out from the crowd, often gaining 30-50% higher salaries than candidates with similar qualifications who lack the same English skills. IIT Madras’s dean (planning) R David Koilpillai said, “Students must be able to communicate technical ideas clearly in interviews. Proficiency in spoken English gives confidence.” In this respect over the past few years NIT Trichy has undertaken measures to correct this. “Students not able to speak or even understand lectures in English is a major problem,” said Srinivasan Sundarrajan, director. The institute now organises bridge courses, workshops and orientations for the students, as well as getting older students to help newer students. English is the global language of business and indeed all enterprise. With the situation unlikely to change in the future, proficiency in English must be seen as a necessary skill across all levels and fields of education.